Monitoring the pages with high bounce and taking decisions should be a standard part of a professional SEO day to day activity. Bounce rates in themselves don’t give the entire story however, it is nearly always necessary to dig a little deeper before a full understanding can be reached and action taken. 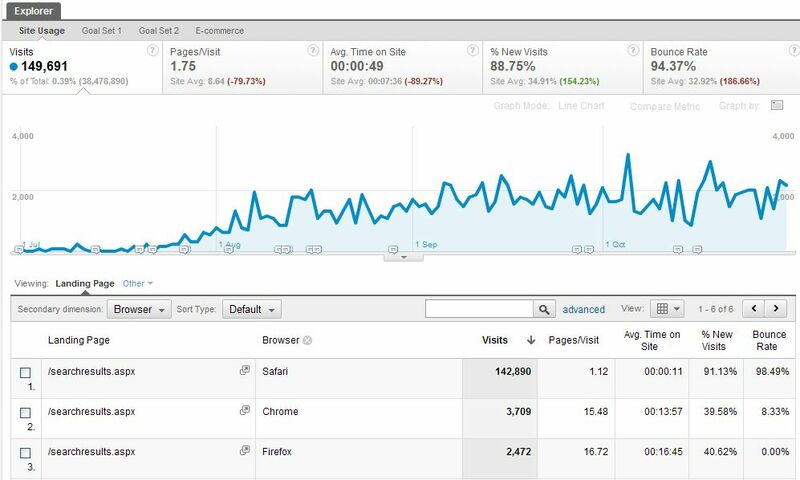 Over time since 20th July 2011, the number of direct visits to this particular page has been steadily increasing – see screenshot from Google Analytics below. The danger is that analysis of visits to searchresults pages alone could show a fake growth, as well as distorting bounce rate statistics… further analysis of the cause of this increase in bounce rate and action to remove these pages from any future reporting is essential. As you can see, Safari is the the browser at the root of this particular evil. The table above shows the majority of visits to the searchresults.aspx page are coming directly from Safari. The Safari 534.50, 534.48.3 and 534.51.22 versions are all calling the searchresults.aspx page directly – as part of a prefetch cycle – and skewing the statistics in Google Analytics as a consequence. Tip: Make sure you understand what is causing bounce statistics before taking decisions. Prefetch can be useful in some situations, to direct the browser to perform a prefetch on ‘prev’ and ‘next’ tags, preparing the browser for the anticipated future interaction by the visitor. The browser will also obey the the link rel=”prefetch” instruction in order to pull the next page. When the browser is idle, it will download the page behind the scenes into local cache, however if the visitor doesn’t continue their journey, then a 100% bounce is guaranteed.